Is a Snow Joe Cordless Right For Me? The type of snow shovel you need will depend upon the amount of snow you need to clear and its frequency. 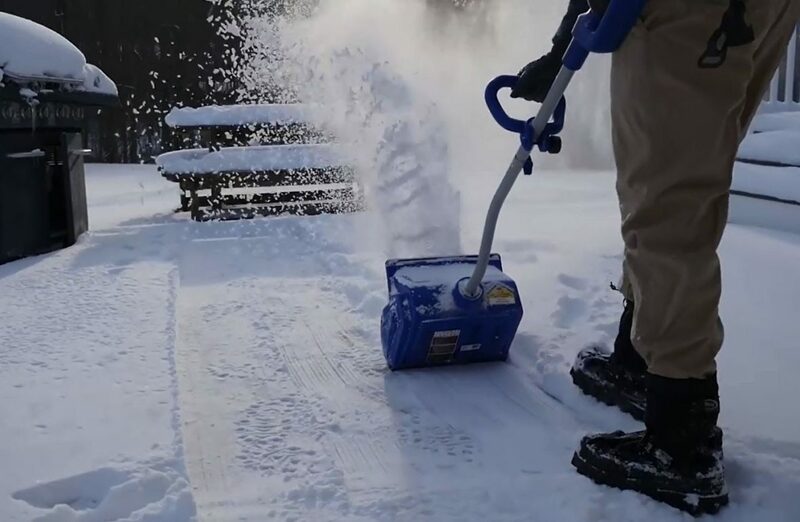 This leading Snow Joe cordless snow shovel is a battery powered snow thrower, which means you don’t have the problem of a limiting power cord. 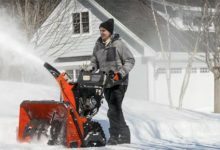 You simply leave it charging overnight, and when it comes to clearing your drive or path in the morning, the powerful battery and 500-watt motor do the job for you. An adjustable handle means it can be used by anyone, and it has specially designed blades for clearing snow effectively and efficiently. 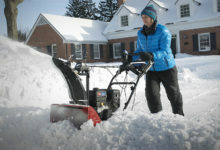 This model can clear a path 13 inches wide – that’s about the norm for a domestic use snow shovel of this type – and will handle a depth of up to 6-inches. It can throw snow a distance of 25-feet so you have good clearance and is capable of moving as much as 300lbs of snow per minute. As it is battery powered and cordless there is no tricky starting up procedure, you simply switch on and get going. There are bigger models than this, but for home use, this one is perfect. 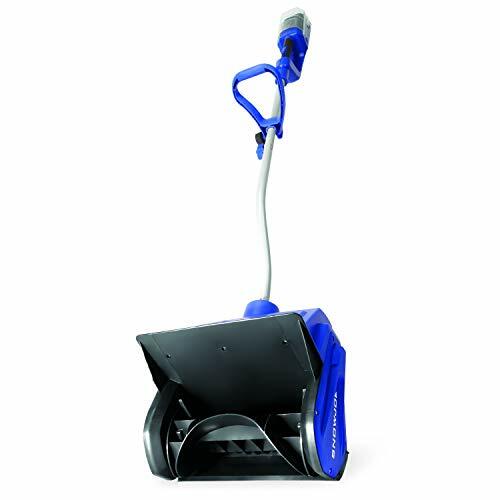 This Snow Joe cordless snow shovel is built to the usual high standards that you would expect of a known brand. It is surprisingly compact and will pack away in a corner of your garage without taking up any unnecessary space. The adjustable handle is a nice touch as it enables it to be quickly and easily altered for use by different members of the family. As this is a cordless battery powered model, there is no need for a power point to get it going (it’s worth noting that there is a hybrid model available, which offers a socket to allow you to run off mains electricity), or extension leads to take it beyond its limits. A full charge of the powerful lithium ion battery – leave it overnight and will not overheat or overcharge – gives you more than 50-minutes of full-power operation, which will easily clear a large area as required. There are no fumes, it’s eco-friendly, and the simple electric starting procedure means you’re ready to go as soon as you want. 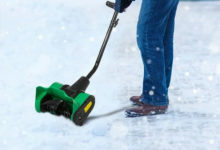 The 40 volt motor is sufficiently powerful and the blades strong and durable, so you can be sure that it will shift the snow you need to move. 300lbs per minute is a more than adequate amount, and you will find it very easy to operate. It also comes with all the safety features you would expect with such a machine, including a quick shut off switch that is always within easy reach. The blades will last a long time, but as with all such machines you need to be careful when it comes to large stones or other obstructions, and as it weighs a mere 14.5lbs it is easy to handle for all. The manufacturer has put a lot of time and effort into the design of the handle, which is comfortable and ergonomically designed, and this easy to use snow thrower will make a fine addition to your tools. 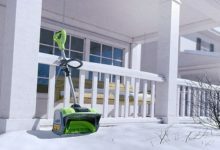 Unlike gas snow blowers, this is a simple to use, basic and straightforward snow shovel that has the advantage of being cordless, and that is light enough for all to use and powerful enough for domestic use on cold winter mornings. 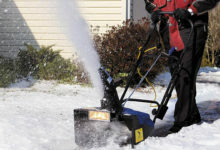 If you are looking for a very large, very powerful snow thrower for industrial or commercial use, this is not it. 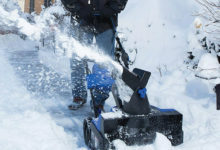 However, the Snow Joe cordless snow blower is perfect for clearing drives and paths in and out of homes, or even for clearing the sidewalk in front of a shop or other premises. It’s intended aim is to replace the manual shovel with an electrically powered version. It will clear a path of 13-inches wide; this is not the largest you will find, but is bigger than some other home-use models. Where it wins is in its compact size. As you are not going to be using it all-year around, you need to store it away, and it will easily sit in a closet and not take up too much room. 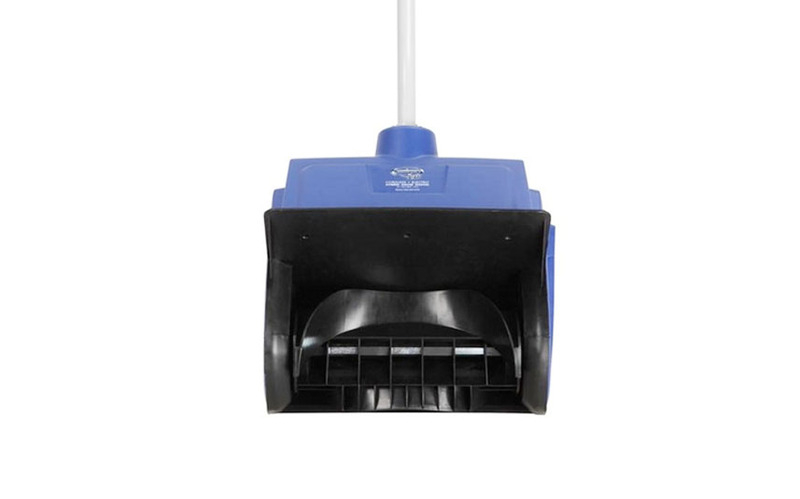 For this type of electric snow shovel, a depth clearance of 6-inches is pretty much the standard. This machine will happily clear away a nice path that will make it easier for people to get in or out, and with over 300lbs of clearance a minute, will also clear your driveway so you can get the car out. 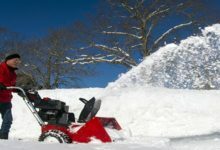 This is a good machine for the home user in an area with regular moderate to heavy snowfall, but for anything more demanding, you might want to look at some other available models of snow thrower. Now you’ve read our Snow Joe iON 13SS review, is it the best cordless snow shovel for you? 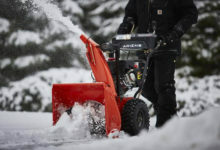 In short, if you want a compact machine to help clear moderate to heavy snowfall from paths and driveways, this is an excellent choice and you’ll love using it every time it snows. It may not be the biggest or the most powerful machine of its type, but it does have a number of advantages: it clears 300lbs a minute and a sensible width and depth, has an adjustable handle and is light to use, and perhaps most attractive of all, it is a cordless battery powered snow shovel that you just switch on and go, so is great for those cold winter mornings. In summary, it’s a well-priced domestic snow shovel that you can’t go too far wrong with. You find a bunch of great Snow Joe iON reviews on Amazon so we recommend you head over there and see what customers are saying.